This entry was posted on March 28, 2011 by Ian. It was filed under Traveller 2300 and was tagged with AFV, apc, traveller, Traveller 2300. Ian, the stuff you do here is awesome! Have you, or have you ever considered lending your skills to producing miniatures? It seems to me that with the ever-improving technology of digital sculpting, you could bring some of these vehicles to the tabletops of wargamers everywhere. I know there are licensing issues with sme of the vehicles from published works, but your talents go beyond the simple interpretation of designs already in existence. i really love your work. I would like permission to base one of my card models that I make on this conceptof yours. I create models in card, create a master and cast in resin. if you want I can send you some pictures of my work. 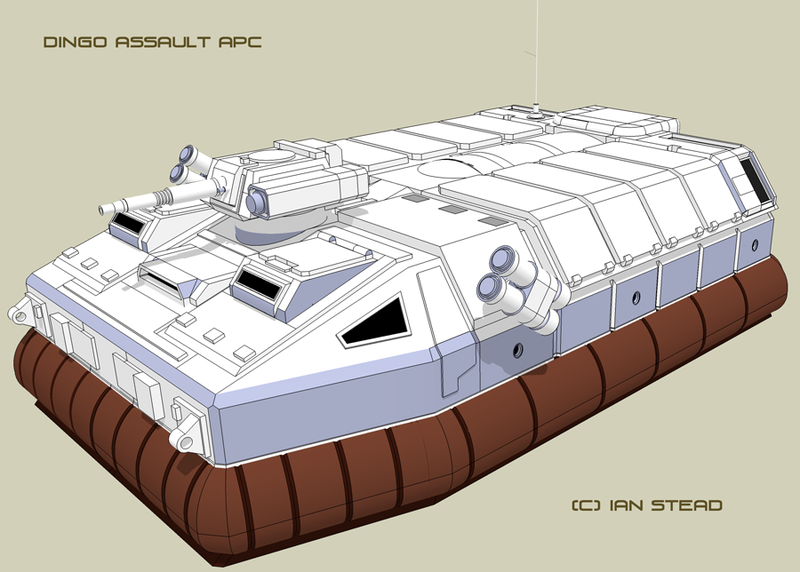 basicly I just want permission to base my next project on this hover APC. Not a problem go ahead! It was a test design that one and not used for anything at all!